On a cold and frosty January day one can’t help thinking about the new vegetable growing season that is yet to unfold. In fact, preparations for the new season continue right through winter. For the Protecting Potatoes project we have had to store tubers in a cold but frost free places and keep an eye out for rot and rodent damage. 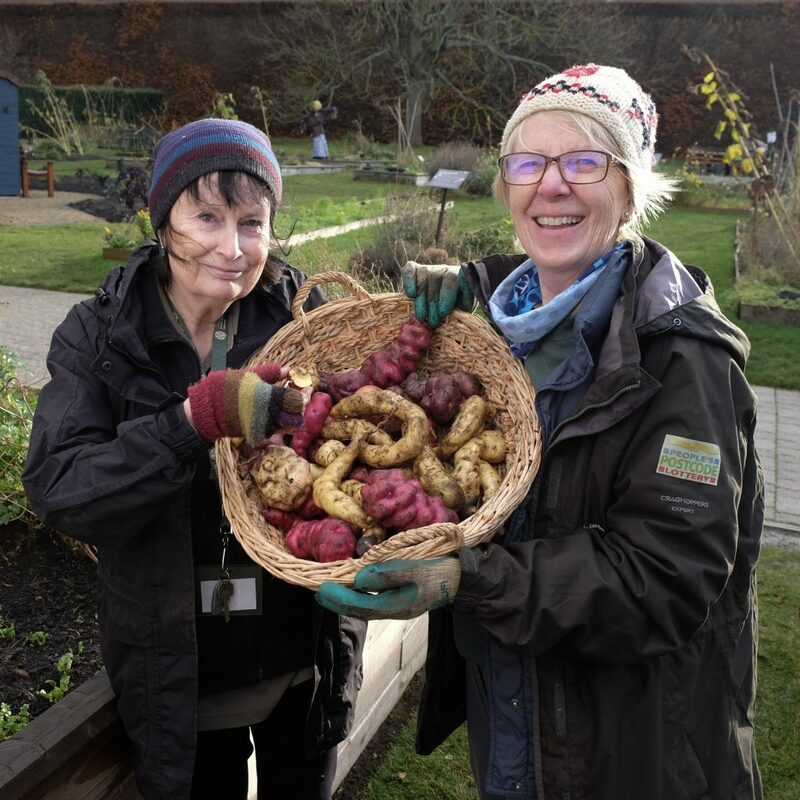 Jan and Liz with a selection of Andean potatoes from the 2018 harvest. The potato patch that was beside the Botanic Cottage during 2018 will be given over to other crops in 2019. Rotating crops is good practice as it reduces the risk of pests and diseases building up and helps the soil to maintain fertility as different crops have different requirements. So, this year the potato patch will be beside the path that runs in front of the Cottage. The aim is to grow the same diverse Andean potatoes that we had last year thanks to the James Hutton Institute. However, alongside them we will be growing potatoes that our volunteers Liz and Jan have created by doing some potato breeding. 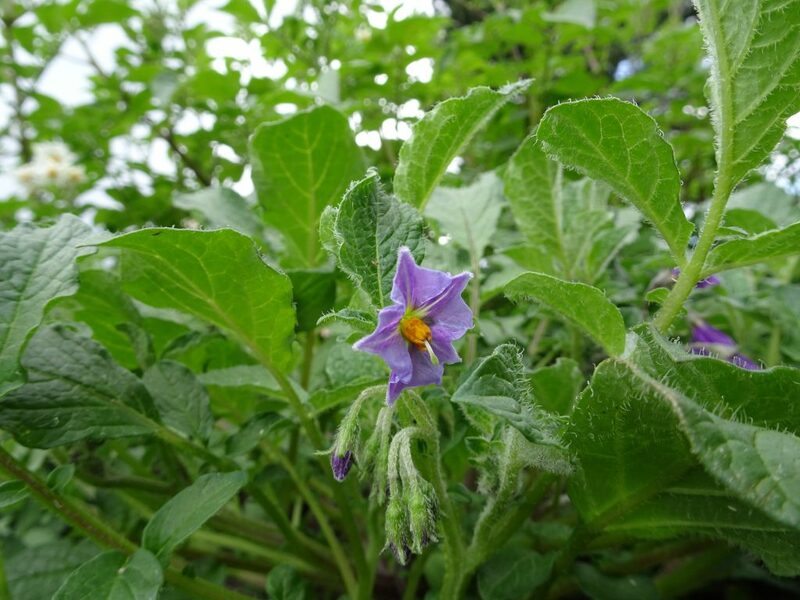 The new potatoes are hybrids between a domesticated potato and a wild Mexican potato called Solanum demissum. The offspring could be variable, which is why we will need to grow many of the hybrids side by side to assess any variation among them. The reason for our interest in this particular hybrid potato is that it was named after Edinburgh in 1911 when plant material supplied by the Botanics was used in the publication of what was thought at the time to be a new species. It was only later on that its hybrid origin was established. The introduction of genes into the domesticated crop from the wild Mexican potato is much more significant than you might imagine. The wild plant has resistance to late blight and hybrids can inherit this trait and pass it on to subsequent generations. I only recently discovered that ‘Lady Balfour’, one of the best potato varieties for organic growers, gains its resistance from the same wild potato that we have been using in our breeding work.